The flower is in a much quieter vein than I. 'Katharine Hodgkin' and I. 'Frank Elder', which are from the same parents, but certainly a worthy new introduction to this family. Light purplish-blue grey falls with a central line of almost orange-yellow surrounded by a broken white patch spotted sectioned medium blue. The erect standards are light purplish-blue with slightly darkish veins and spotting. Leaves hardly show at flowering time. 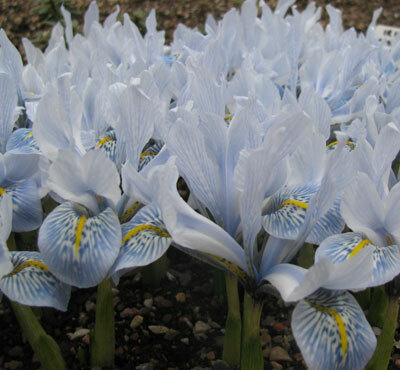 An intentional cross between Iris histrioides 'Major' & Iris winogradowii that was made by Mr. Brian Germaney of Grimsby.